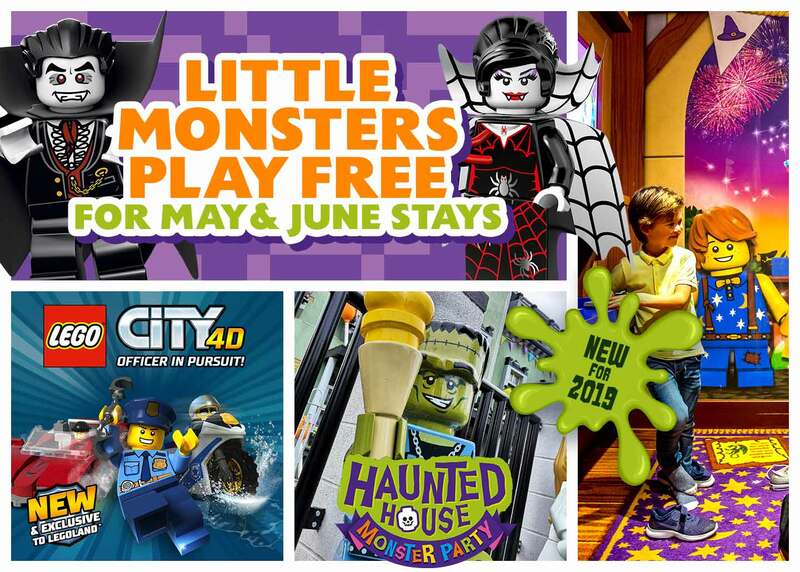 Join us this May and June and your Little Monsters Play FREE in the Theme Park! Plus, get your 2nd Day FREE in the Theme Park when booking your LEGOLAND® Resort Hotel, LEGOLAND® Castle Hotel or nearby hotel stay. 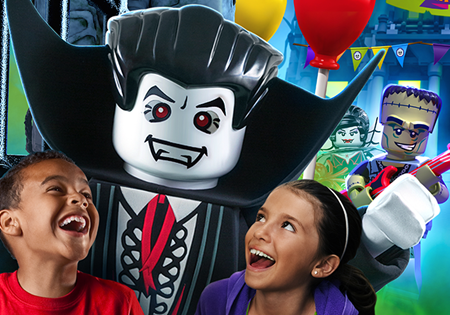 LEGOLAND Holidays tip: Stay in Resort accommodation and you'll receive 30 minutes Early Ride Time to selected rides – including the The Haunted House Monster Party (available from 14th April)! 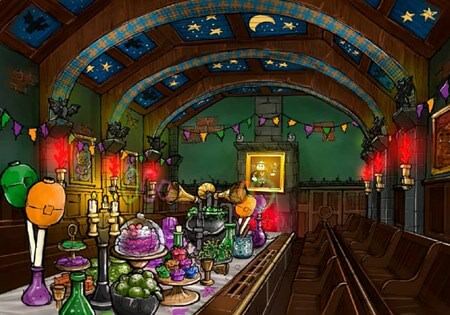 Opening on Saturday 13th April, join us for a monster party at Lord Vampyre's spooky new Haunted House, celebrating his arrival in the LEGOLAND® neighbourhood. Lord Vampyre loves flying and being upside down like a bat! It's the best bit of being a Vampire! He's going to use a fang-tastic potion to turn the house upside down! Meet your favourite characters! Get your best monster pose ready to meet Lord Vampyre, Mummy and Monster Rocker! Here's a sneak peak! 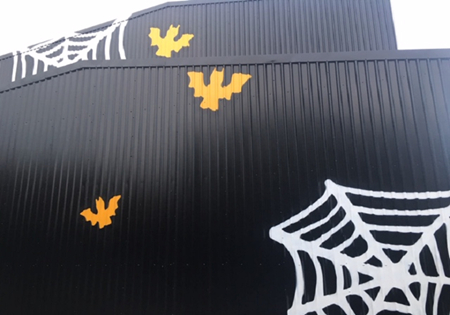 Lord Vampyre's spooky new home is coming together brick by LEGO® brick. "I'm supposed to drink WHAT?!" He likes to read comic books with his pet bat, take long walks by the seaside (after sunset, of course), and throw huge parties in his big stone castle. "I'm supposed to drink WHAT?!" He likes to read comic books with his pet bat, take long walks by the seaside (after sunset, of course), and throw huge parties in his big stone castle. "Vould you like to meet my friends? I do hope you're not too ticklish!" Some Vampires are fond of bats and rats, but the Spider Lady just adores spiders. She uses them in all her home decorations, and even weaves her own gowns out of the purest Spider Silk. "Vould you like to meet my friends? I do hope you're not too ticklish!" Some Vampires are fond of bats and rats, but the Spider Lady just adores spiders. She uses them in all her home decorations, and even weaves her own gowns out of the purest Spider Silk. "Hee-hee-ha-ho-hoo! This'll be my greatest creation yet!" The Monster Scientist is obsessed with making things that the world has never, ever, seen before. His ideas are very silly, from butter resistant toast to rocket-propelled shoelaces. "Hee-hee-ha-ho-hoo! This'll be my greatest creation yet!" The Monster Scientist is obsessed with making things that the world has never, ever, seen before. His ideas are very silly, from butter resistant toast to rocket-propelled shoelaces. "Shock and roll, my rockin monsters!" When Monster Rocker really gets into the ghastly groove, his creepy chords can wake up the Gargoyle, set the Wolf Guy's hair on end, and even get the Zombies tapping their toes! "Shock and roll, my rockin monsters!" When Monster Rocker really gets into the ghastly groove, his creepy chords can wake up the Gargoyle, set the Wolf Guy's hair on end, and even get the Zombies tapping their toes! "Zappo!" The Mummy's favorite thing to do is put ancient mummy curses on people. He just loves it when you wake up with slimy frogs in your bed, or suddenly find your shoelaces tied together. "Zappo!" The Mummy's favorite thing to do is put ancient mummy curses on people. He just loves it when you wake up with slimy frogs in your bed, or suddenly find your shoelaces tied together. "Oops. Overslept again." The Gargoyle likes to hang out on rooftops so he can see all the way across the city, but he has a habit of falling asleep and a gargoyle nap can last anywhere from days to centuries. "Oops. Overslept again." The Gargoyle likes to hang out on rooftops so he can see all the way across the city, but he has a habit of falling asleep and a gargoyle nap can last anywhere from days to centuries. Don't miss out on our latest news, events and offers — sign up to receive emails from LEGOLAND® Holidays and the Merlin Entertainments Group today! Please see legoland.co.uk for updates on ride open dates. 2nd Day FREE is a Theme Park entry day that must be used on consecutive days after your first day of entry into the Park. 2nd Day FREE does not apply to themed weekends held at the LEGOLAND® Resort Hotel. 2nd Day FREE applies to main season breaks and excludes winter packages. LEGO®, the LEGO® logo, the Brick and Knob configurations, the Minifigure, NINJAGO®, DUPLO® and LEGOLAND® are trademarks of the LEGO® Group.